The cucumber is soft-spoken. It’s flavor is neither strong nor brash. As a result it’s a vegetable that often doesn’t get a lot of respect. You might even say it’s the Rodney Dangerfield* of vegetables. At best the cucumber is a supporting player adding texture and crunch to other ingredients that hog the spotlight. In gazpacho, you think of the garlic, peppers or tomatoes. In cucumber sandwiches, it’s the bread and butter or cream cheese. And in salted cucumber slices, even the salt steals focus from this hapless crunchy food. It’s not unlike the rice cake in the world of starches—whatever you put with it, on top of it, even in the same room with it, becomes what the particular dish is about. I have not, let’s be honest, ever consciously identified with the cucumber, but maybe it’s time. I have real sympathy for the cucumber’s plight and understand very well what it’s like to be overshadowed by a friend or colleague. In truth, my problem has long been not so much that I am watery and subtly flavored, but that I make my witty comments under my breath so no one hears my comedic gems unless they happen to be right next to me. In grade school this meant that sixth grade joke poachers (you know who you are Scott Woosley) could rebroadcast my best lines and receive full credit for them. So there is something personal in the recipe this week as I honor the cucumber and try to give it some long overdue recognition. And I can tell you that given this chance to shine, the cucumber has humbly done so. There are a lot of cucumbers in this soup—four to be exact. Yet in typical fashion, they don’t force their way onto your tastebuds, they just somehow arrive there. (Maybe the spoon plays a part here.) I have this vegetable sharing the bill with such powerful flavors as garlic, dill and sour cream, yet this soup is all about the cucumbers. The competing flavors are present in every spoonful but the cucumber base is what brings the whole thing together. This soup also holds up well either hot or cold, something that cannot be said for a lot of soups. Now, I make no claim to be the one who discovered cucumbers or even brought them into their own. But I do think this recipe gives them the respect they deserve. Maybe there’s a lesson here that we mumblers can take away from this posting. But then, who would admit to getting life lessons from a vegetable? *Note: to those of you unfamiliar with Rodney Dangerfield, he is the cucumber of comedians. Heat the butter in a 3-quart sauce pot over medium heat, add onions and sauté until tender (about 5 minutes) , stirring occasionally. Add stock, cucumbers and seasoning, bring to a boil, then reduce to a simmer and continue simmering for 30-45 minutes. Remove from heat and puree with an immersion or standing blender. Return to heat, add dill and simmer for 10-15 minutes. Stir in sour cream and serve or cool down the soup and serve chilled. It’s delicious either way. Photo of author by Caroline Andres, copyright 2010. Comments? Questions? Requests? My inspiration comes from a wide range of sources. Why not join the conversation and add your particular flavor to the mix. I’ll be listening and responding. Great blog; the chicken soup recipe reminds me that I always liked Caroline’s (perhaps I shouldn’t assume they are Caroline’s?) English chicken prints; I hope they are up somewhere prominently in your new home. Thanks for reading and for the comment, James. The chicken painting is also Caroline’s. Chicken prints hers as well. Hey Phil. Excellent, excellent posting. This was my favorite thus far – although I’ve enjoyed them all. Your “cucumberness” really shines through. Subtle, smooth, filled with rich humor… Mr. Woosley gets no credit this time. Thanks for the kind words. Try the soup, it’s a good one too. 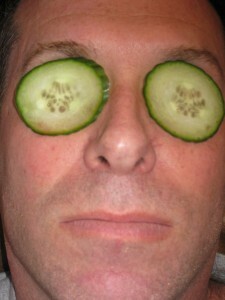 I’m not sure the cucumber slices on the eyes really gave the me complexion I was looking for but they tasted good. Keep reading. Oh, and the photo is wonderful! Nice touch, Caroline. Your Cucumber Soup was splendelicious, how about that for a word? Do you think the O.E.D. bobbies will get me for that? Hi, Phil. I finally got the chance to make several of your soups recently, including this one. Unfortunately, I only got a taste, as Declan ate the entire batch! The taste I got was delicious, however (as was also indicated by Declan’s response). I’m going to wait for the summer, though, to make it again as the price for the four cucumbers was almost $10!! (Organic, off-season, yeah, yeah.) I’ve copied it into my recipe file and it will be there when the prices come down… Yum. Yikes. 10 dollars is a lot. At that point, I just say nuts to organic. I applaud your commitment and am glad you (& Declan) liked the soup. Thanks for reading.